In line with King’s College London’s dedication to the advancement of knowledge, learning and understanding in the service of society, the King’s College London Alumni in Malaysia are humbled with having this opportunity to give back to our nation. 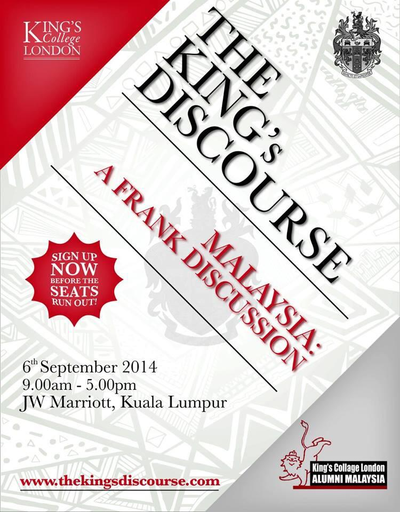 The King’s Discourse aims to be a platform for an open and honest discussion of many issues important to our nation. Thought leaders and industry captains will come together to enlighten and inspire. Do I have to be a member of the Kings alumni to join? Nope! We believe that it is important as alumni to reach out and engage every pocket of the community, and as such welcome all critical thinkers to join us.